Take your party decorating skills to the next level with these adorable Zoo Crew - Zoo Animal paper straw decor that is perfect for your baby shower or birthday party. Using the included clear stickers, simply attach the shaped paper cut outs to the straws then place it in a fun jar or bottle, or even use them as cupcake decorations. Sold in a set of 25 straws and 24 paper cut-out embellishments. 4 Zebras (3" x 2.75"), 5 Lions (1.75" x 2.25"), 5 Giraffe (2.25" x 2.5"), 5 Monkey (2" x 2"), 5 Elephant (2.5" x 2.5") paper die cuts. Printed on a heavy card stock paper. 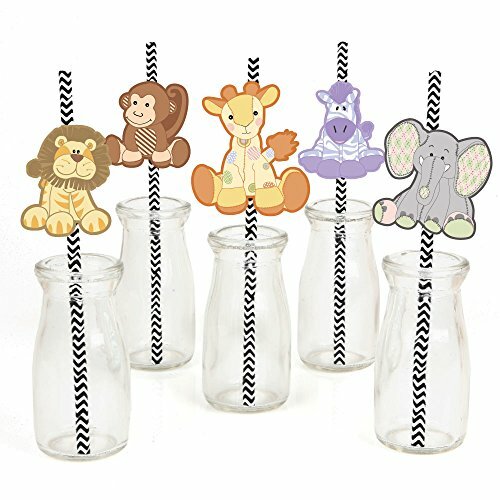 Zoo Crew Straw Decor INCLUDES 24 safari paper cut outs, 25 coordinating paper straws & clear stickers for easy assembly. Yes, you'll receive one extra straw. Zoo Crew DIY party supplies are perfect for a baby shower or birthday party. Zoo Crew Straw Decor party kit SIZE 4 zebras 3" wide x 2.75" tall; 5 lions 1.75" wide x 2.25" tall; 5 giraffes 2.25" wide x 2.5" tall; 5 monkeys 2" wide x 2" tall; 5 elephants 2.5" wide x 2.5" tall; and 25 chevron striped paper straws 7.75" tall. EASY PARTY DECORATIONS: Zoo Crew straw décor will add a touch of cuteness to your baby shower or birthday party tables. Jungle safari straw décor will also look great at your beverage bar. Use these adorable zoo animal accessories as straws or swizzle sticks. The paper straws can also be cut in half and used as cupcake picks once the shaped cut out is attached. PREMIUM PARTY SUPPLIES: Zoo Crew paper cut out straw decorations are professionally printed on heavy-duty cardstock paper with a photo-like shine. They are individually inspected and carefully packaged by hand, along with coordinating paper straws. Zoo Crew Straw Decor will require some easy assembly. Simply adhere the shaped cut outs to the straws using the included clear stickers. Get creative with your DIY baby shower or birthday party decoration ideas!